Painting or staining brick can seem like a very daunting task, especially on larger homes or commercial buildings. To help you get the results you want, our professional painters would like to offer a few tips on the process of transforming your brick surface. 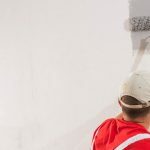 When performing any exterior project, our professional painters make sure to always have all the tools and products necessary to get the job done effectively and efficiently. 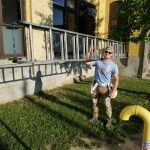 Staining and painting brick requires many similar tools, equipment, and products to achieve the highest quality finish. Drop sheets are used to wrap the ground around the brick building or surface to protect paint or stain from ruining any gardens, walkways, or other ground surfaces. This can include a pressure washer, hose, bucket and water, clothes/rags, or exterior surface cleaners like Natura Safe Prep. When preparing to paint or stain brick. it is crucial to make sure the brick surface and mortar are completely clear of dirt and debris prior to application of products. This includes all poles, roller cages, sleeves, brushes, sprayers (if applicable), trays, liners, and cut cans. You may also need ladders depending on the size of the brick surface. Having ladder arms, a pivot block and cut can hooks will help aid in making the ladder work easier and safer. We also recommend using a standard 2.5” brush, like a Nour Brilliant Brush, to assure clean cut lines, and even paint/stain distribution. A high-piled roller sleeve (anything above 15mm) will more effectivity push the paint or stain into the brick and mortar. This example kit is not completely exhaustive, however it does cover all the basic tools and equipment needed while undertaking an exterior brick project. 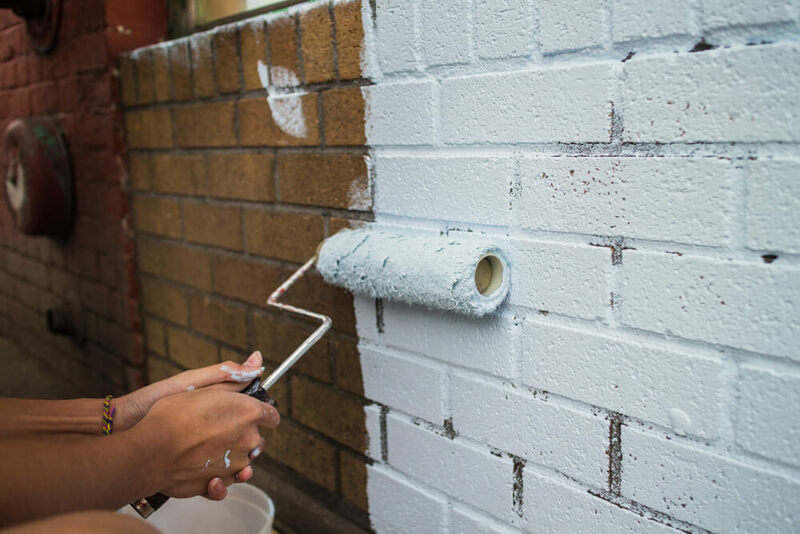 The following steps cover all the basic procedures required to paint or stain your bare brick. Prime out the brick with one coat of primer. We use products like Sherwin Williams Extreme Bond Primer. This will allow the paint to adhere to the brick and guarantee the finish you are looking for. It is important to note that priming bare brick is NOT a necessary step when staining the brick. Apply two coats of paint using your desired method and exterior paint. We suggest Sherwin Williams Resilience or Duration for superior durability and coverage. In terms of stain, we suggest using H and C Concert Stain and applying one or two coats of stain, depending on your desired finish. By using the example kit and procedures above you, will be fully prepared to tackle any brick painting or staining project. If you are still uncertain you can handle the work, the professionals at New Approach Painting are always ready to turn your dream project into reality. Contact us to get your project started today!